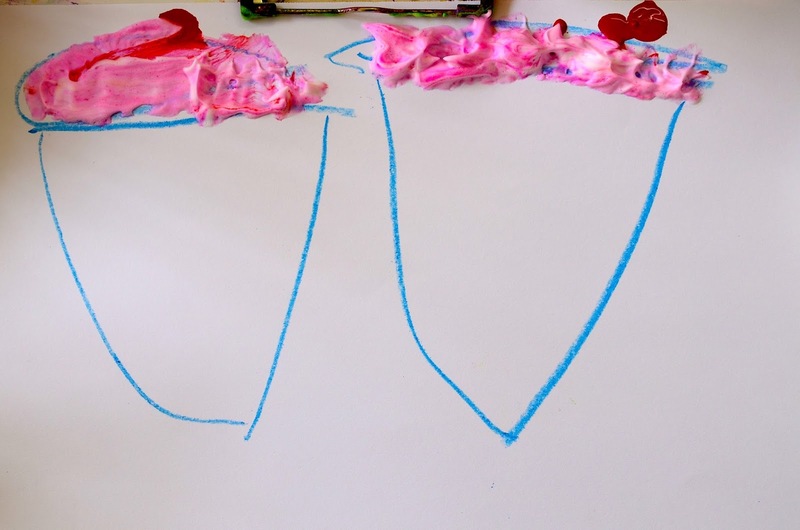 I have posted earlier on how we used shaving cream as messy play on glass doors and mixing paint in a baking dish full of foam. Well it was time to use brushes. So we mixed in some paint in bowls full of creamy shaving foam to make 'puffy paint', and painted some drawings! I recently posted on how my 3.5 y.o. had started drawing, so I teach him simple stuff every day, such as draw a watermelon slice, ice cream cone, trees, houses, cuz they all boil to simple shapes, don't they! He was thrilled to 'color' his creations with puffy paint! Some drawings with store bought puffy paint that never puffed up! 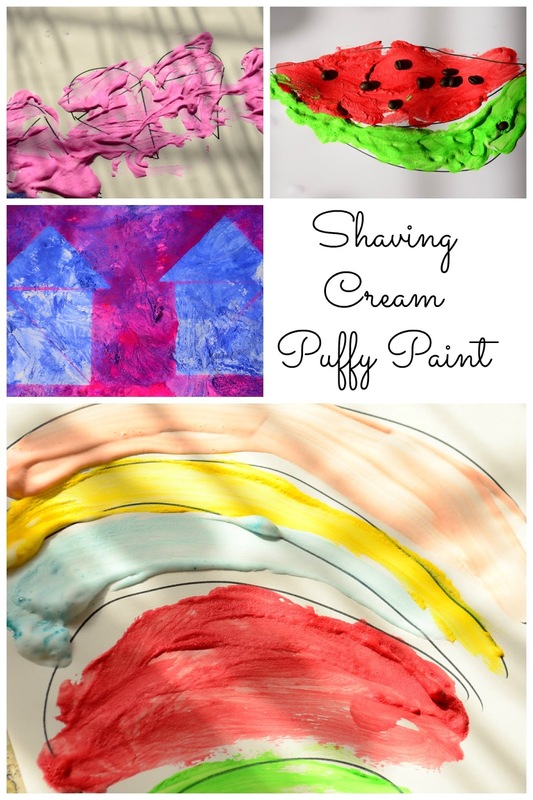 You may come across many recipes for puffy paint revolving mixing glue and shaving cream and some requiring an oven or hairdryer to puff it up. But I kept it simple! Just mixed shaving cream with paint. The caveat with my *simple* method though is preservation of art. The puffiness naturally wears out the next day- although leaving behind a gorgeous texture. *But* the big issue is the powdery residue that keeps coming off! The issue is similar to preserving salt & glue projects- the salt keeps coming off! And can be quite annoying if you have to move it around. So either you frame it ASAP, or put it in a plastic folder that contains the residue. As for me- I don't actually bother much with preserving art projects (Gasp!) (I do take a million pictures though!). I simply put em in a big plastic box and 'sort' em once in a couple weeks. *Most* projects are tossed out! I'm not being a heartless witch, I swear! It's just that its simply a *lot*. Also we are constantly moving and we travel super light! So some of the *really* cool projects are "filed" (like literally, punched and put in binders!) and will be stored at my parents place, i.e. until I figure a cooler way to store it! I'm hoping my kid will get creative enough to think of ways himself, some years down the line! The pink shaving cream mix reminded me of the cute little Ice-cream cone fridge magnet my kid had got home from school! So figured why not teach him how to draw an ice-cream cone! It's just a V, a sleeping line and an upside down smile! I drew the cones here, to show him how. 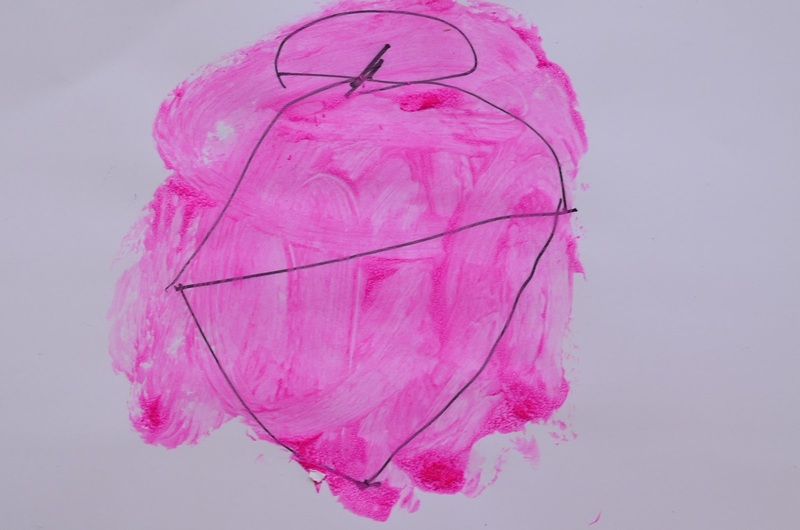 He painted the cone pink too! He made this himself, the first time. With a cherry on top! I guess in course of time he figured only the ice-cream was strawberry flavoured, not the cone. We did later 'color' he cone with a flesh tint chalk though. 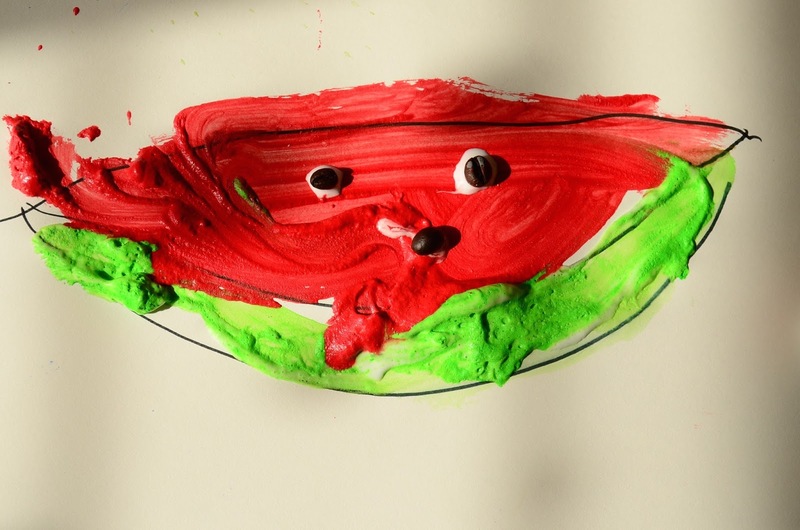 Then came the watermelon slices, two smiles and one sleeping line! We even stuck a few coffee beans with glue to look like seeds! And then we tried the rainbow, which he drew and I helped paint. As shaving cream is soapy, bowls, palettes and brushes can be washed easily. We did this everyday for a week, so unlike tangram pieces that could be re-used without washing once the paint dried off, the bowls needed to be washed everyday. I cannot comment on the toxicity, but can on the puffiness. The foam, as expected naturally fizzled away by the next day. So we washed bowls and started afresh every day. I'm especially making a note on this, as *practicality* is very important for parents to be encouraged to promote art at home! Embracing a mess is one thing and going bonkers over clean ups is another! Oh I absolutely LOVE this! Pinned it. Stumbled, too. Please stop by my blog Tuesday evening EDT to share this on my blog hop? Awesome Idea! Thanks for sharing at the Laugh and Learn Link up! These are so cute! I love puffy shaving cream paint!!! Amazing and so so create, just love it thanks for sharing it on Dream Create and Inspire.